Myself and Arek decided to give the Kildare 100 a blast again this year. Its a sportive in aid of the Marie Keating foundation with Martin Earley (an ex Irish pro) helping out. We did the tour last year for the first time, it was also the first time I cycled in a large group. We also found out that once the cop car left the pace jumped up immediately. We got left behind before we even knew the pace car was gone last year, so this time around we wanted to at least keep up with fast guys. From the looks of things at the start line I'd say there was in the region of 400 to 500 riders at the start, which is quite a handful to manage considering they are all departing at the same time, but like last year, there were plenty of marshals that held up traffic when required. So we headed off around 10am and for the first 20km's we just tapping along enjoying the leisurely aspect of the cycle. We stopped at the North Kildare sports club for tea and food, and after about 15 minutes we headed up the road a couple of kilometers to Kilcock, hanging a left over the canal bridge and on toward Clane. When we got to Robertstown a couple of guys jumped on the first climb (well, lets call it a kicker - it was pretty mild), but we had them back in after a couple of hundred meters. Again, the pace slowed down and I decided it really was time to hang back. The next major climb was coming into Kilmeague which shook things up a bit I got a little caught and was chasing up the hill and down the other side before I got back with the lead group. I was there or there abouts when we reached the big climb of the day - The Wall. Funnily enough it did not seem as hard as last year. My biggest problem was with getting blocked in by slower riders on the climb. I finally managed to catch back up with Arek near the top. 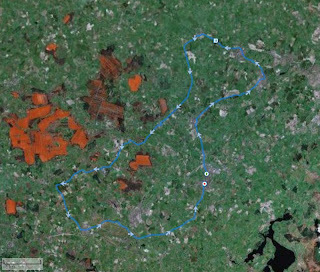 From there it was a sprint down the other side and through Kildare town. At this stage a lead group of about 20ish had formed and the pace had really picked up. As we hit the Curragh I got to the front and put a big stint in, and as soon as I did I realised I was blown. Guys started coming through and kept the pace high. I started to go backwards, but as we crossed the motorway had managed to hold the gap to about 50 meters. However, try as I might, I could not bridge the gap back up. Even a motorcycle marshall tried pacing me back, and he even let me draft him, but to no avail. I watched the group of about 10 slowly pull away - with Arek in it! As we left Newbridge I dropped the pace and let a boards.ie rider catchup. 2 riders working together had a better chance than one. And at one point we did catch a glimpse of the back of the lead group, but again they vanished around a bend and that was it. So we kept the pace up and pushed on to the finish back in Naas, and in the end we were only a couple of minutes behind the lead group. We even got a round of applause which was nice! I know, I'm talking about this charity cycle like it was a race, and to all intents and purposes, the second half was, and great fun too! The marshals were great, and the food after was class too. I'd highly recommend the tour of Kildare to anyone who fancies a bit of bit to their sportive!